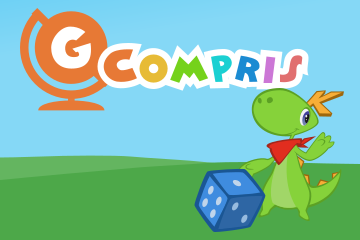 GCompris is a complex educational software suite that has been built with children aged 2 to 10 in mind. Most activities are game-oriented, and this makes learning new things a lot of fun! - "Simple Letters" is a fun game in which you will have to type the displayed letters before they fall to the ground. - "Click and draw" allows children to "draw" nice pictures by simply clicking the green dots. - "Logical associations" is a game in which children will study patterns, and then come up with the next symbol in a sequence. - "Discover the Braille system" helps children learn the tactile writing method which is used by visually impaired people. - "Explore Monuments" allows kids to explore various monuments around the world, based on their location. - "Locate the countries" is a drag-and-drop game which helps children learn geography. - "Melody" is a memory game which requires your kids to remember, and then reproduce a particular sound sequence. - "Explore World Animals" allows children to discover lots of exotic animals from around the world, learning interesting facts about them, as well as their location. - "Music instruments" helps kids learn about, and then recognize various musical instruments. As mentioned above, these are just a few of the built-in activities. The good news is that GCompris is an ongoing project, so new activities are added to it regularly. So, be sure to get this great piece of software by clicking the button below.